I am so excited to begin my 8th year teaching kindergarten at Holy Trinity Catholic School. We are going to have a wonderful year! Below is information that you may find helpful as you and your child begin the journey of Kindergarten. We use the Treasures reading series for our reading and writing curriculum. Starting in October, leveled reading books will be sent home the last day of each school week so that your child can practice throughout the weekend. Please also remember to keep practicing our "Word Pocket" words throughout the year. We will learn 72 new words in all. Many of these words cannot be sounded out phonetically so children will need to be able to recognize these words by sight. We will also be devoting much time in making sure we can write all the letters of the alphabet correctly, (all letters start at the top and we try to do them in as few as strokes as possible) and neatly. We will work on using spaces between words and writing sentences using a capital letter at the beginning of a sentence and punctuation at the end. We also will be incorporating Daily 5 into our weekly literacy schedule. The activities included in Daily 5 consist of Read to Self, Listen to Read, Writing, Word Work and Read with a Partner (which we don't practice until the later part of the year). All these activities are essential for your child to become good writers and readers. Our math series is Everyday Math. Everyday Math really uses the spiral effect which means that we keep coming back to our basic skills we have learned and build on them. Most of our math work is very "hands on" and we will be doing a lot of games and activities in class. You won't see a lot of math work from our math series coming home with your child for this reason. Each week there will be a "Home Link" on the back of our weekly newsletter. This Home Link consists of an activity that we have been working on throughout the week. These activities can be done at home and there is no need to turn anything in from these Home Links. We also incorporate Math Boxes into our math units. Math Boxes are simply activities that are incorporated and reviewed throughout the year to help your child meet the required math standards for kindergarten. Math Boxes are done with a partner and are fun, hands-on activities or games that help children build strong thinking skills in math. God is Good is our new Religion Curriculum by Loyola Press that we will begin using in Kindergarden this year at Holy Trinity. Most of the work we do will be hands on so you may not see a lot of "religion papers" coming home with your child. We also make a book about the 10 commandments and during advent, we learn about the bible stories through the Jessie Tree. At Easter we use Resurrection Eggs to tell the story of Jesus suffering and dying on the cross to save us from our sins. We also will be having clergy visits every week and we will also be attending mass every Friday. Our Kindergarteners will be planning two masses this year. All the children will have a reading part and some children will have another non-reading part. 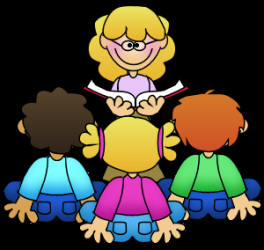 Kindergarten Masses for this year are scheduled for January 26th and April 20th. Our science curriculum will allow our kindergarteners to do many investigations. We will be using the Foss Science Kits to learn about Wood, Paper, Fabric, Recycling and Motion. Music, Computer, Library and Phys-Ed are our specials. Specialists will be teaching these subjects at least once a week. Music will be taught by Ms. Joan Straw and Library will be taught by Mrs. Trista Kowalzyk,. Computer will be taught by Mrs. Kristi Godbout and Phys-Ed is taught by Mrs. Carolyn Andres. Social and Art are integrated into our other subjects throughout the year. Below is a link to our classroom schedule so you can see when we do what, each and every day. If at anytime you have any questions or concerns, please feel free to contact me. I am looking forward to a great year with all your children!